So you finally convinced your pastor to add a subwoofer to your church sound system, and I congratulate you! Now you are probably searching the web, looking for the best gear in your price range. One of the most disappointing things that can happen in this process is for you to get a sub, hook it up, and it not sound the way you were hoping. This post is designed to protect you from that disappointment and give you some basic tools so you can buy the right equipment. This goes without being said, but you will need to buy a sub. Personally, I am a JBL guy when it comes to pro audio, so I am going to recommend that you buy a JBL sub. I have never been disappointed with a JBL purchase, which is why I can confidently recommend this brand. Currently, my church uses a JBL SRX728S Dual 18in Subwoofer. This sub sells for around $1,700, which is a fair price for what you get. Keep in mind, you will also need an amp to power this sub, which adds another $1,000 to your purchase. This is the only sub I have ever used, and would buy it again. However, if this is out of your price range, I have heard good things about the less expensive JBL product lines (MRX & JRX) and would not hesitate purchasing these either. Dual 18” sub or single 18” sub? The only difference between a dual 18” sub and a single 18” sub is the amount of power handling and sound produced. For small rooms (less than 1200 square feet), one single 18” sub would probably be sufficient. For medium sized rooms (1200-3600 square feet), one dual 18” sub or two single 18” subs would get the job done, although I have found that a dual 18″ sub works more efficiently and produces more sound than having 2 single 18″ subs. Anything larger than that would need at least two dual 18” subs. First off, if you are buying a powered sub, you will not need an amp because it is built into the actual speaker cabinet. But for those who are buying a passive sub (which is most common), keep reading. It is extremely important to give your sub the proper power, otherwise it will not operate at its fullest potential. 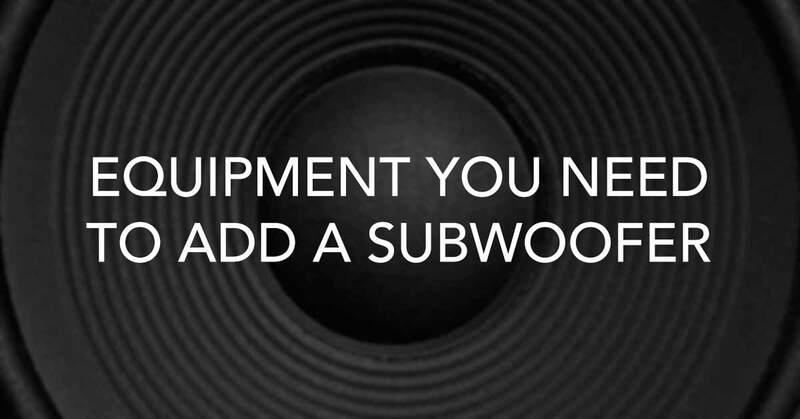 So the first thing you need to determine is the power handling of your sub. Lets use the JBL SRX728S for our example. It has a 1600W/3200W/6400W (Continuous/Program/Peak) power rating. The goal is to find an amp that will comfortably produce the program power rating (3200W in this case). So then comes the question of ohms. This dual 18” sub operates at 4 ohms, so we need to find an amp that produces at least 3200W at 4 ohms. The more ohms, the harder an amp has to work, so the less power it is able to produce. A single 18” sub will operate at 8 ohms, so you will want to have two of these ‘daisey-chained’ together, which would then cause them to operate at 4 ohms, getting the most power out of your amp. So back to our example. To power this sub, I would use a Crown XTi 4002 Amplifier, on the bridge-mono setting. This gives us a whopping 3200W at 4 ohms, but only 2400W at 8 ohms. This shows the importance of knowing your ohms! The reason I run this amp on the bridge-mono setting is because subwoofers do not need a stereo signal, but they do need power – and lots of it. A crossover tells the lower frequencies to go to the sub, and the mid and high frequencies to go to your mains. This ensures that your speakers are able to operate at their fullest potential because the are not having to produce unneeded frequencies. The amp we chose above actually has a built-in crossover, which saves you some money. Also, Crown and JBL are close relatives, so there are a lot of great tools available to help you fine tune the settings on your crossover. Whatever you do, do not underestimate the importance of the speaker cable you use! With this much power flowing from the amp to the sub, you should definitely get a 12-Gauge speaker cable. I am a huge fan of LiveWire cables because I have never had any problems with them. You also need to double check your connections at the sub, and the amp before you buy. In our example, you need a speaker cable with a Speakon connector at one end (for the sub), and a banana plug at the other end (for the amp), in order to use the bridge-mono setting on the amp. Keep in mind, bad cables = bad sound. Don’t ever compromise on your cables!